Good helmet - Sun visor feature very helpful , good build quality, quite heavy - included insert for the visor makes such a difference. Only negative is that since it is Matt black if you're hands are greasy or whatever it will leave fingerprint marks on the helmet. Great fit, excellent vents (rarely does the visor or my glasses fog up), and snazzy aesthetics for a generous price. Additionally, high safety score and delivered very quickly indeed! Haven't tested the helmet in action, but so far everything is great. Firstly the shipping to Lithuania didn't took that long and all the gear came up in perfect condition. Itself the helmet came up with all the features I expected, big pinlock for the visor, double d chin strap, wind curtain for the neck and breathing deflector. Perfect full kit for the helmet! And it fits tight and comfortable, can't wait when I'll try it on the road. Excelent service and the product, I'll keep ordering more often from sportsbikeshop for sure! Quality speaks for itself, hjc produce high quality helmets which cost a fraction of other brands. Used these for years on track and crashed in them, they did the job every single time. This is my 5th IS17 and will buy another when the time comes! The only faults i can pick with this lid is the ventilation could be improved on and made better! Also a slightly bigger chin curtain would make all the difference. Fit is down to individual heads so I won't talk about that. This is just a great value helmet with a nice finish and feel. The badge on the top could mean a far more expensive lid so you can enjoy a inexpensive without the badge. My second IS-17 and I'd recommend it. This helmet has it all for a mid-price buy...comfortable washable lining, pinlock (supplied),internal visor, good ventilation, and it's pretty quiet. My old hat was well past its use-by date, so the comparison will be biased, but I would happily recommend it and the rapid response team at Sportsbikeshop. I even love the graphics! The helmet has a good quality feel to it. Good finishing, light, confortable, fits great in my head and is highly ventilated. Intregated sun visor is useless (for me), but it does the job. The only con is the wind noise. I saw reviews saying this was quiet but apparently it isn't. Came from my old helmet from a lesser brand (G-MAC) that was more quiet than this. Even my two old AGV helmets are way more quiet. For the price, I'm very happy. Great helmet, barely realise the included pinlock is there but it almost competely eliminates fog. Buttons for the air vents are quite flimsy. Otherwise build quality very solid. I had previously worn a shoei helmet but this one is far more comfy, has more features and I think also looks better. Overall a brilliant helmet. My wife now wants one for her. Needed a new helmet at a reasonable price from a reputable maker (Ride recommended for several of HJC's helmets). This fitted the bill, bought size 2XL as I have a round large head, fits nice and comfortably tight around the face. First ride of 280 miles in freezing cold and damp conditions helmet held on well and felt comfortable all the way. D ring strap took a bit of getting used to from previous clip locks but held more secure to me. Recommend this as a mid price good buy. This is a very good value good looking helmet. The built-in visor is great for days when you don't expect to see the sun. It's lightweight, easy to open and secure when closed. The fog barrier works well. The compromise, and it's a big one, is that there is a constant squeak from inside the helmet caused by the styrofoam lining. If you can live with that then this is the helmet for you. I've had a number of helmets over the years, but this one tops them all! the pin-lock is sized perfectly for the visor and I don't notice it is there like I have with previous helmets. The fit of the helmet is spot on and the packaging it was delivered in was very well put together to prevent any damage in transit (Always a worry when buying online) and the courier service even shows where the delivery driver is in real time. Very happy with the service! Great service from sportsbikeshop, ordered a large which was a little too big, returned via free delivery (UPS) and medium was with me in a couple of days. Great helmet for the money! 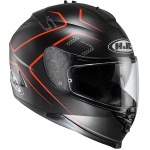 I only buy HJC helmets, quality and comfortable fitting. Needed a new lid. Well made, excellent sun-visor, good value. This helmet cost me the same as a visor and insert for my last helmet and I think its a better helmet for half the price. I currently have an HJC helmet for off-roading and it has lasted well. So I think this is a quality product with good features for a bargain basement price. I've gone with HJC after purchasing the original RPHA 10 in 2012. 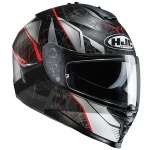 I was always a Shoei man but after seeing the quality and fit of the HJC I was sold on it. Six years on I've gone for the IS-17 because it's a 5 star rating, has an integral sun visor and it's an absolute bargain. After two weeks use I'm not disappointed. 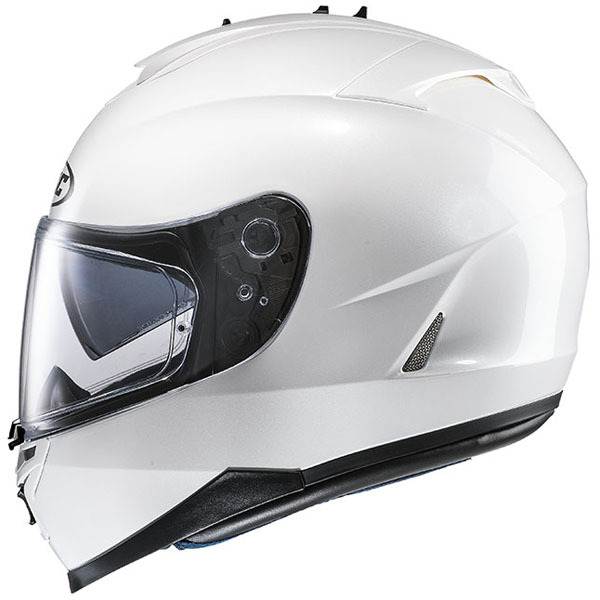 The main downside over the RPHA 10 is the weight and the lining feels a bit cheaper but given the price compared to the RPHA 11 it's a good quality helmet and was an absolute bargain.